Which model is recommended when people looking for GPS Tracking Device? When people looking for GPS Tracking Device for Cars, which one is recommended? iStartek VT202 Cheap GPS Tracking Device, VT206 motorcycle GPS tracker, or VT600 GPS fleet tracking device? Of course not, based on market research around 80% of people will choose VT900 GPS tracking device for cars. Let’s list customers opinions one by one. Reason 1: VT900 GPS tracker device can show you accurate history playback. Everyone install GPS Tracking Device on their car main purpose is for real-time tracking, its a kind of real-time GPS tracking device. Once we install VT900 GPS tracking device for cars, we can check car current location in real time or check VT900 GPS tracking device history route, see where the car was going, below photo is VT900 history route on GPSwox platform, we test it together with our clients in Dubai warehouse. Our Dubai client is very satisfied with VT900 GPS tracking device working performance, then take VT900 from us directly. Why VT900 GPS tracking device history route so accurate? Because VT900 GPS tracker has auto log when no GPRS function,When there is no GPRS connection, the tracker can store all GPS information triggered by preset tracking Interval, alarms, request, or button activation and send this information (FILO – First In, Last Out) to server by GPRS or preauthorized mobile phone by SMS when GPRS connection recovers. Reason 2: VT900 GPS tracker price it is very cost efficient, there are rare supplier can provide 3G GPS tracker device, and among those 3g tracking device companies, our price is around 30% lower. Why our price is much lower? Because we put very limited investment in advertising for the iStartek brand and directly give benefits to customers. Reason 3: VT900 GPS tracker support multiple functions, it can be used for rental company vehicle tracking and fleet management, its a kind of GPS fleet tracking device. 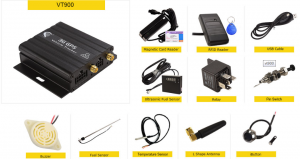 VT900 GPS fleet tracking device support many functions, such as RS232 Port can connect with Magnetic card reader or RFID Reader for driver identification, connect with Ultrasonic fuel sensor for fuel monitoring, connect with relay for engine cut, connect with buzzer for overspeeding alarm etc. Reason 4: VT900 GPS tracker is 3G version GPS fleet tracker, it supports UMTS/HSDPA 850/900/1900/2100Mhz. Some countries closed 2G network already, they must use 3g GPS tracker, such as Thailand, Australia, New Zealand Singapore etc. And some other countries, their telecom providers are planning to close the 2g network soon, so 3G will be the trend. Finally please remember we are Manufacturer in China for various GPS tracking device and Routers, if you have any related demand welcome to contact us freely.